Fur Vest Outfits: Furs-the word brings to mind plethora of meanings that we come across in the fashion world. Furs have long been associated with human beings to warm themselves up during the cold season. Also they are revered by the rich and the elite; especially by women who think that furs are their need. Now it is a symbol of extreme luxury if you are investing into an original one and a symbol of femininity even if you are purchasing a faux fur coat or a jacket. Layering in winters is essential and what can be more mod than a fur vest as it gives a slimmer look. The choice is altogether yours of selecting from the types available. Huge varieties and collections of furs have been made available in the market. There are the long ones, the short ones, pastel hues or dark tones, full sleeved to sleeveless ones. Rough and tough vests for the stylish street look to the black tie events elegant vests. And if you want to look your best these winters with your innate style and a touch of sophistication do invest in one hefty piece to work with. 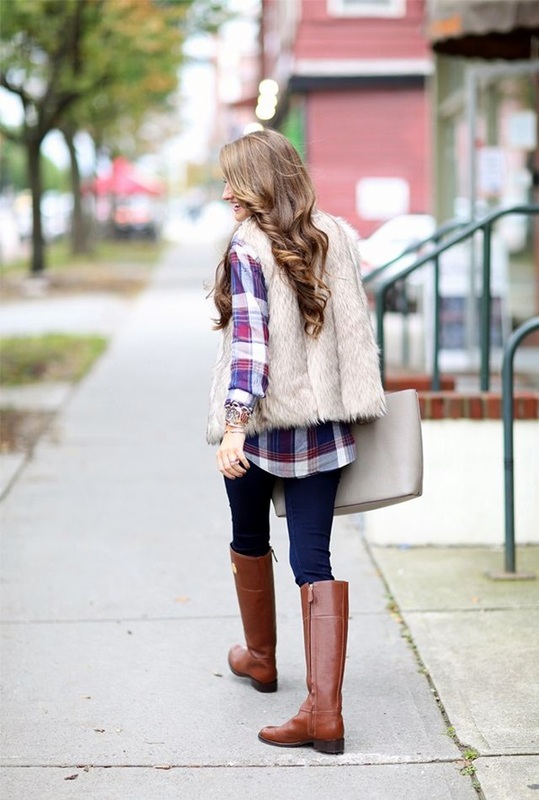 Fur vests give an instant boost to the otherwise ordinary outfit and make you look classy. They can be styled with turtle necks, cardigans or a just plain shirt. 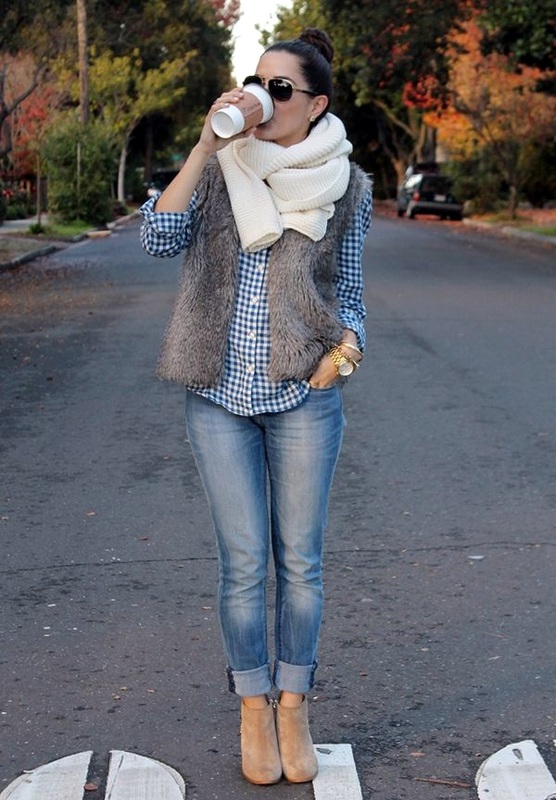 With winters being around the corner we have collected best 17 styling ideas with vests. Have a look and enjoy! Dressing up for a day out in the autumn season can be challenging when you want to look your best. Picnics and country walks offer a great opportunity to show case your skills. This is a very simple outfit in terms of elements jelled up together. So whenever this is the case focus on the cuts and the quality for the desired results. Blue velvet skinny trouser will make this nice loose top in beige look extra remarkable. 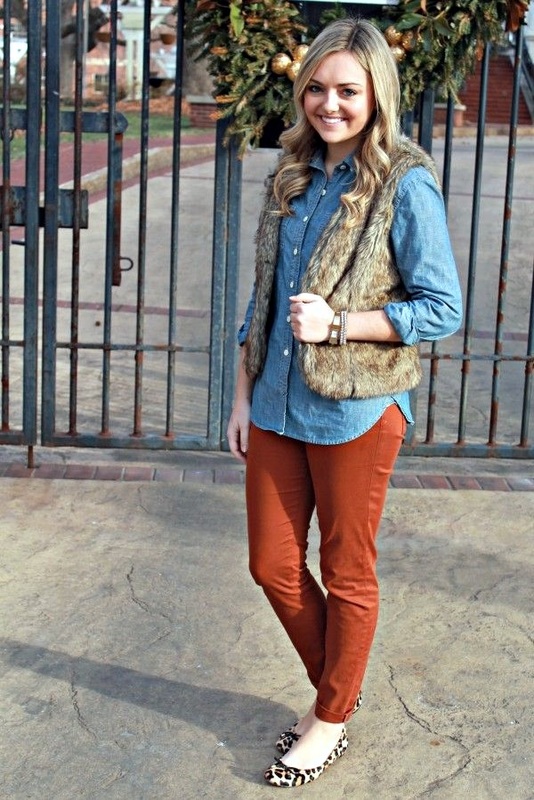 Jazz up the whole look with a brown fur vest and gorgeous horse back riding shoes. Accessorize with some jewelry. Being overweight never means that you should adopt a lame dressing style. Being upfront in the fashion is always good for the soul. This outfit is simple with respect to the every element that is being worn but look how mod the person is looking. Nice rolled up denim with peep toe platforms and a plain old black shirt jazzed up by the grey vest. A touch of red on the lips is the only makeup you for running your errands. Country girls want practicality with a little chic which is really what every girl wants so absorb this outfit as it should be worn in every winter. From the horse riding shoes to the skinny denim to the beautiful plaid and flannel shirt tucked in (or kept out); the outfit is charming. Add in the vest and it is delightful. Slightly roll your hair with natural makeup and liner. Meeting up someplace out? Plan your outfit by keeping this style in mind. 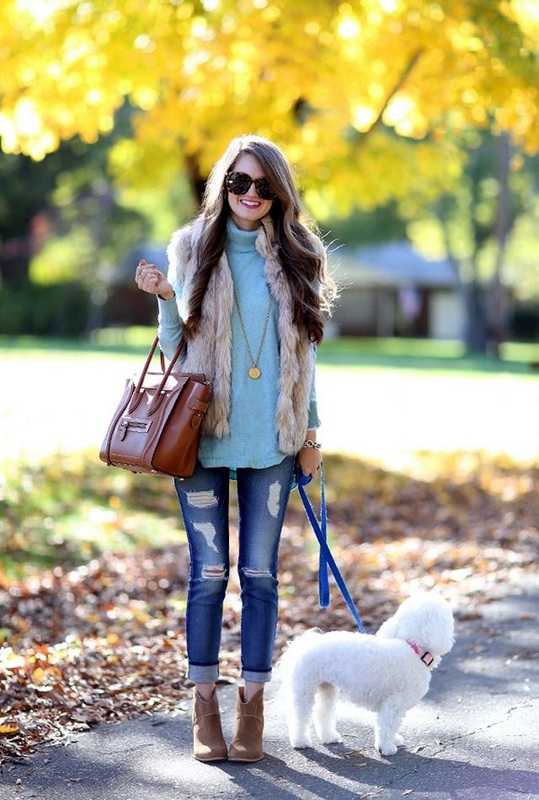 Beautiful fur vest matched perfectly with a turquoise turtle neck and frayed boyfriend jeans. Brown suede boots for the comfort and a nice big bag for shopping if there is a change of plans. Tie up a pony tail with a side bang as its easier to keep them in check. But your choice totally. Celebrities keep reminding us of the latest trends coming in. So its always good to keep a check on the fashionistas in the industry. Kendall Jenner is very chic is styling her outfits as we can see. A pair of black leather pants and a fitted coat with a long fur vest in contrasting colors. Choose black pumps with the dress and a matching designer bag. This outfit requires no accessories. Mini jackets look really stylish and so do mini vests. They are just worn for the purpose of pure fashion and nothing else. So pair it up with leather pants and a graphic black top in full sleeves to keep warm. Movie nights with dates will go smoothly. Do wear some makeup and add a matching clutch with a chunky ring. Keep your boots on but heeled pumps will also look gorgeous. An everyday outfit which requires no effort on your part. Just take out your old denim shirt and slim fit pants. Add a vest and viola! Animal skin flat pumps will do the rest for the outfit.